10. What Is a Real American? I love this album! Rock is back. Great songs, great vocals, amazing guitar- All this and a message too! Let's pray Armageddon doesn't come because I want to hear more! But if it does come at least we will have some great music to play us out! Not only is the music great, the concept is really fun and interesting. This is an album I can listen to over and over again. Very talented musician! Great Guitar - Looking forward to more! This is a great album, in fact words couldn't do it justice. I totally agree with its message and enjoy listening to the album over and over again. There's not a bad track as every song is unique and could stand alone. 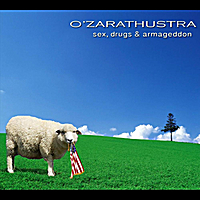 My only question is where and when is O'Zarathustra's next project? KRAP listeners are tuning in to find out...hopefully before 2029.